Wi-Fi communications in vehicles, whether from the factory or in aftermarket devices, will increase from 6.9 million per year in 2015 to 61 million per year in 2020 -- and this will usher in a new era of consumer services and applications, according to a new report from Gartner. Over the next four years, the total number of connected cars and trucks will reach 220 million, a number that will drive a huge uptick in the delivery of digital content, such as streaming music and video, navigation and location-based services. 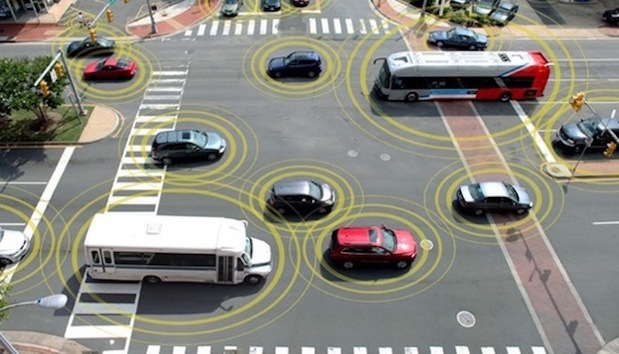 Connected vehicles increasingly will be able to direct drivers to, and pay for, parking spaces, fuel and other services, and the technology will eventually enable increased levels of automated driving, Gartner's report stated. For example, three years ago Audi rolled out its Audi Connect wireless parking-payment program, which connects cars and parking lots' services. The technology not only lists the location of area lots, but allows parking barriers to be raised -- and automatically pays for spaces. The Audi Connect service also provides drivers a list of area gas stations along with real-time pricing information. Internet-connected vehicles will also enable innovations in related businesses, such as insurance, car rental, car- and ride-sharing services, and electric vehicle charging. "Connected vehicles will streamline many of the processes currently in use in the businesses. For example, a rental car could be provisioned remotely, allowing the customer to pick it up and drop it off without having to go to an office," said James Hines, a research director at Gartner and the report's author. "They will also enable new modes of operation; for example, when combined with autonomous driving capability, connected vehicle technology will allow a customer to request a ride and a vehicle could be automatically dispatched to the customer’s location." Connected vehicles will improve access to EV charging by locating available stations and paying for charging services; they'll also be able to monitor the state of charge of the battery in the vehicle, Hines said. "Many of these functions are performed with smartphones today, but connected vehicle technology will allow tighter integration with the in-vehicle systems, which will enable a higher degree of automation of these funtions," he added. "The connected vehicle is the foundation for fundamental opportunities and disruptions in the automotive industry and many other vertical industries." By 2018, embedded communications modules will overtake mobile device tethering via dongles attached to vehicle OBD II ports as the dominant mode of connectivity in cars, the report stated. Since 1996, all vehicles have had standardized OBD (onboard diagnostic) ports, which allow mechanics to check the status of various vehicle subsystems. Over the past several years, the insurance industry has been utilizing OBD ports to offer rate discounts when drivers agree to plug dongles into them, which allow insurers to track a vehicle's driving history. Internet connectivity will also be critical in supporting new automated driving functions, such as adaptive cruise control, collision avoidance and lane departure warning systems, all of which require real-time camera and sensor data processing and pattern recognition. From 2016 through 2020, Gartner predicts, uture connected car applications will drive a 150% increase in demand for contextual information, such as image detection and geolocation. "As cars become more automated, they are being equipped with an increasing array of sensing technologies, including cameras and radar systems," Hines said. "Many automobiles will use image detection as the primary means to identify and classify objects in the vicinity of the vehicle so they can provide more sophisticated responses and even have autonomous control." Improving fuel efficiency and reducing emissions will necessitate sophisticated engine and transmission control systems, which are relatively low-level functions well suited to vehicle microcontroller units. As human-machine interaction technologies -- such as touch control, gesture control, gaze control and speech recognition -- increase, so too will the need for more sophisticated middleware. Middleware will also support consumer telematics services that allow the car to communicate diagnostic and maintenance information and address driver and passenger queries, as well as support over-the-air software updates. As middleware grows to process the tsunami of new data, cars and trucks will require more powerful processing hardware, which is what is precipitating the shift from 8-bit microcontrollers to 32-bit processors in vehicles, Garter stated. The automobile chip business is already booming and has become one of "the hottest target markets for semiconductor makers," according to The Wall Street Journal (WSJ). Over the past year, according to the WSJ, chip makers have penned a total of $75 billion worth of deals with the auto industry. Today, the WSJ reported that Qualcomm is in talks to acquire Netherlands-based NXP Semiconductors for more than $30 billion. The deal would make Qualcomm the largest supplier of chips for cars. In 2014, Freescale became the first top microchip supplier to announce an automotive-grade Ethernet chipset and software, paving the way for car makers to install 100Mbps networks in vehicles. Freescale's processors connected in-car electronics, such as telematics and infotainment systems, to Wi-Fi routers over standard two-wire twisted pair cable, versus CAT 5, making it robust enough to serve as a networking topology for vehicles. As connectivity grows, however, so too will potential cybersecurity holes. The federal government and carmakers have already expressed concerns about the potential for increased vehicle cyber attacks. Last week, the U.S. Department of Transportation (DOT) released guidance to the auto industry (PDF) for self-driving and highly automated vehicles, which included security recommendations. For example, the DOT stated, consumers should receive "meaningful data privacy and security notices," along with choices about "collection, use, sharing, retention, and deconstruction of data, including geolocation, biometric, and driver behavior data that could be reasonably linkable to them personally." Additionally, this month, Volkswagen announced it would form a cybersecurity company headed by Yuval Diskin, the former head of Israel's security agency. Security is on consumers' minds. In July, KPMG released a survey of 449 car-owning consumers. Some 70% stated they are concerned about the possibility of their car being hacked within the next five years, and if their car was hacked, 79% said it would leave them with a negative perception of the automaker. The concern cuts across generational lines, with 83% of baby boomers and 74% of millennials saying a hack would damage their view of that automaker, the KPMG report stated. "Cyberattacks are affecting nearly every single company we encounter, but we're not seeing those attacks drive enough proactive business action as evidenced by the rate of investment made in information security," Greg Bell, KPMG's Cyber U.S. Leader, said in a statement. "We're still seeing companies taking a passive or reactive approach toward cybersecurity, when in fact cyber should be a top-line business issue thought about and practiced company-wide."